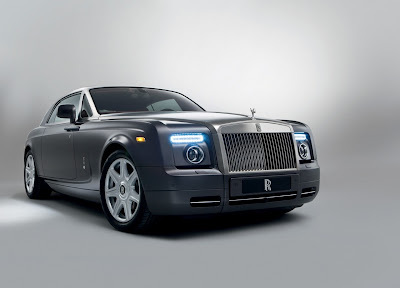 Rolls-Royce Motor Cars previewed its two-door, four-seat, Phantom Coupé in New Delhi, on 28th February, 2009, for the first time to a select audience. The Coupé, the fourth new model from Rolls-Royce under BMW Group ownership, is the most driver-oriented model in the current line-up, in the context of Rolls-Royce luxury values. This two-door, four-seater model completes the Phantom family, adding to Phantom, Phantom Extended Wheelbase (four-door saloons) and Phantom Drophead Coupé (convertible). A luxurious, modern grand touring coupé in the finest tradition, this car is powered by the Phantom's 6.75-litre V12 engine, producing 460hp and 720Nm of torque making it the definitive choice for all-day, long distance driving. With its engine tuned for immense low down torque, the new Rolls-Royce effortlessly achieves the 0-100 km/h sprint in 5.8 seconds and continues rapidly towards an electronically governed top speed of 250km/h. A combination of segment-leading fuel economy and a 25 per cent increase in fuel capacity, compared to the Drophead Coupé, increases driving range to more than 600 kilometres. A spacious picnic boot with split tail compartment gives easy access to 395 litres of space or four sets of golf bags. The lower part of the tailgate provides a comfortable seating platform for two adults when lowered.